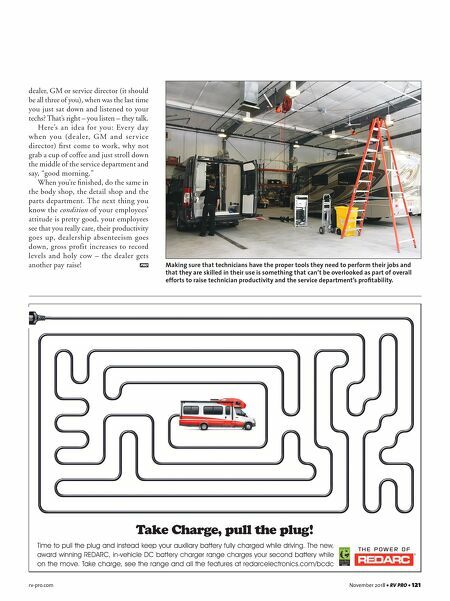 rv-pro.com November 2018 • RV PRO • 121 dealer, GM or service director (it should be all three of you), when was the last time you just sat down and listened to your techs? That's right – you listen – they talk. Here's an idea for you: Every day when you (dealer, GM and ser vice director) first come to work, why not grab a cup of coffee and just stroll down the middle of the service department and say, "good morning." When you're finished, do the same in the body shop, the detail shop and the parts department. The next thing you know the condition of your employees' attitude is pretty good, your employees see that you really care, their productivity goes up, dealership absenteeism goes down, gross profit increases to record levels and holy cow – the dealer gets another pay raise! 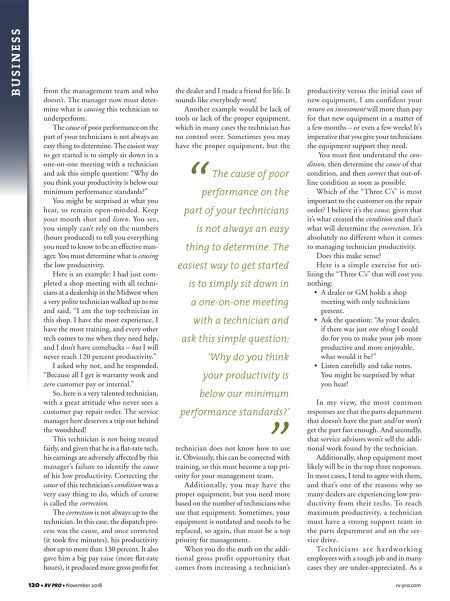 Making sure that technicians have the proper tools they need to perform their jobs and that they are skilled in their use is something that can't be overlooked as part of overall efforts to raise technician productivity and the service department's profitability.